The Hamilton Tiger-Cats re-signed veteran linebacker Simoni Lawrence to a two-year contract Monday and then came to terms with defensive back Delvin Breaux on a three-year deal. The Hamilton Tiger-Cats have locked up two key members of their defence. 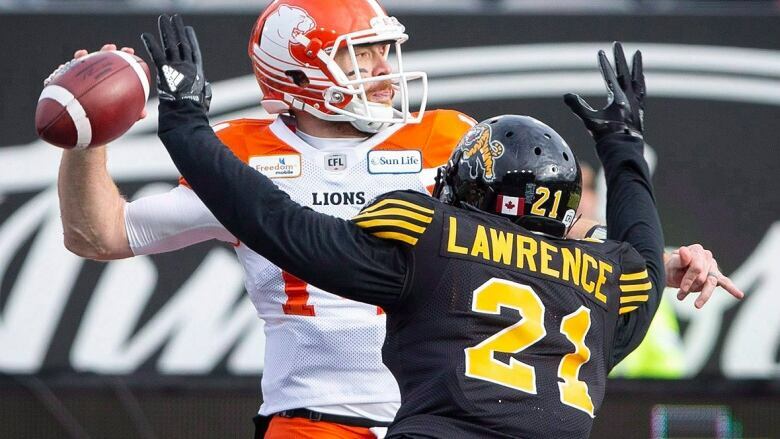 The CFL team re-signed veteran linebacker Simoni Lawrence to a two-year contract Monday and then came to terms with defensive back Delvin Breaux on a three-year deal. Lawrence, 30, and Breaux, 29, were scheduled to become free agents Tuesday. Lawrence had 68 tackles, three sacks, three tackles for a loss and a fumble recovery last season. The six-foot-one, 231-pound linebacker has started 97 of 113 career CFL games with Edmonton and Hamilton. Lawrence has registered 435 career tackles, 21 tackles for loss, 22 sacks, eight interceptions, 10 forced fumbles and 10 fumble recoveries. He's appeared in 11 playoff games, including two Grey Cup appearances with Hamilton (2013-14). He was the East Division's top defensive player and a CFL all-star in 2015. Breaux is a two-time all-star, the latest honour coming last year after he returned to the Ticats following a three-season run with the NFL's New Orleans Saints. In 2018, Breaux started 14 games boundary corner for the Tiger-Cats, recording 24 defensive tackles, three fumble recoveries, two forced fumbles, two pass knockdowns and one tackle for a loss. "Delvin is one of the most dominant defensive players in the Canadian Football League," Ticats head coach Orlondo Steinauer said in a statement. "Not only is he a great player, but a great person who enables us to keep continuity in the secondary. We are very excited to be able to retain a player of his calibre on a long-term deal." Canadian linebacker Sam Hurl has signed a one-year contract extension with the Saskatchewan Roughriders. Hurl, 28, had 41 tackles, six special-teams tackles and two tackles for a loss last season with Saskatchewan. The six-foot-one, 230-pounder also had three tackles in the Riders' 23-18 West Division semifinal loss to Winnipeg. A seven-year veteran, the Calgary native also spent three seasons with Winnipeg, has 207 career tackles, 53 special-teams tackles and eight sacks in 108 regular-season games. He has also played five career playoff games and was a member of Saskatchewan's 2013 Grey Cup-winning team. The B.C. Lions re-signed Canadian offensive lineman Hunter Steward and receiver Bryan Burnham, both pending free agents. Steward's deal is through the 2019 season while Burnham's contract is for two years. The six-foot-six, 315-pound Steward started 14 games last season and 58 over five seasons with B.C. The Lions selected the Calgary native in the first round, No. 6 overall, in the 2013 CFL draft. "Hunter's size and ability can make him one of our most dominant offensive linemen," general manager Ed Hervey said in a statement. "He has reached a point in his career that we're going to be depending on him a great deal in both pass protection and running the ball. "It all starts at the line of scrimmage and if we're going to see improvement there then Hunter will be a big part of that development." The six-foot-two, 205-pound Burnham led all B.C. receivers last year with 67 catches for 1,029 yards with nine TDs. It was his third straight 1,000-yard season. "Bryan is a big part of our offence and this is a key signing for us on the eve of free agency." said Hervey. "We believe that we haven't yet seen how good Bryan can truly be in this league."